​Deletes temporary files that are left on your computer after you browse using Google Chrome browser. Settings User Interface displays new "Exploit Prevention" category. Exploit Prevention category displays the list of individual techniques so that the customer can turn on or off any individual technique. 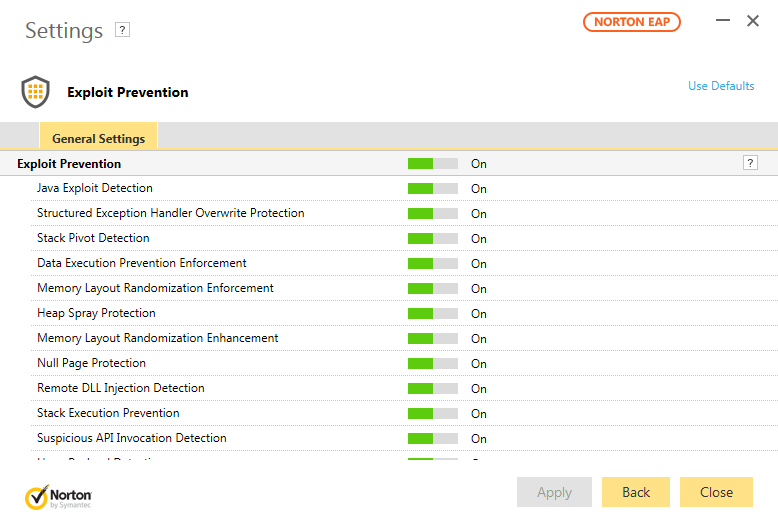 Starting this version the Identity pillar in the main user interface will be greyed out until Norton Security toolbar extension is installed or configured for the browser. To install/Configure click on the Identity Pillar and follow the setup instructions. Starting this version, the Identity Protection Settings (Seen in below image) has been moved to the browser extension/add-on.